I realized one might not need to have held a new born baby to know the joy of a mother on safely delivering a baby. I felt that joy. It was 5th day of August 2010, I was sitting in the coach following news closely despite a doctor’s advice to take rest, but this was not the time to miss the happenings in Kenya. I was wishing I can scream and shout aloud, WE HAVE A NEW CONSTITTION, but flu had put me down and I could only shout in my heart. I could not believe that it was finally here, the joy can not be described in words. I had been so passionate about the proposed constitution, that for me this was just a climax and my ill health didn’t deter my joy. The constitution making process in Kenya has a long history. The previous constitution of Kenya was made at Lancaster house upon the Kenyan independence in 1963, and now was another moment to get a new homemade constitution. The first referendum was marred by a lot of politicking with the proposed constitution getting edited a long way to the extent that Kenyans no longer recognized their efforts in bringing their views into the constitution, and hence in 2005 the proposed constitution was rejected. The constitutional moment was reignited in 2008 following the post elections violence in Kenya, the worst violence to ever be experienced in Kenya that left many Kenyans killed, injured, displaced and the belief in the national processes seriously challenged. The national accord was signed that allowed for power sharing and creation of the prime minister and deputy prime ministers’ position. One of the most critical aspects of the national accord was the popular ‘Agenda 4’. The long standing issues identified under Agenda Item 4 included: a) Undertaking constitutional, legal and institutional reforms; b) Tackling poverty and inequality as well as combating regional development imbalances; c) Tackling unemployment especially among the youth; d) Consolidating national cohesion and unity; e) Undertaking land reforms; f) Addressing transparency, accountability and impunity. A national cohesion commission, a commission of inquiry into the post elections violence and the Transitional justice and reconciliation commissions were among the institutions that were set up to handle different aspects. The Electoral Commission of Kenya that was blamed for the flawed elections was disbanded and the Interim and Independent Electoral Commission (IIEC) was set up. Quite critical was the constitutional making process, and the process required that : Parliament to enact a Review Statute including a timetable; Parliament to enact a referendum law; The preparation of a Draft Constitution in a consultative process with expert assistance; Parliament to approve the Draft Constitution; and, The people to enact a new Constitution through a referendum. The law was passed during the crisis period and it was made water tight enough not to be interfered with at different levels as has been the case in many instances. The Committee of Experts (CoE) was set up and the process started and the progress was more of a parachute that has been released and it had to land, could not be stopped halfway. Since November 2009, different drafts were given with consultations and give and take and in May we finally had the Proposed Constitution of Kenya (PCK) that was to be subjected to the referendum, the final and climax process. I have many aha moments in the journey that Kenya undertook and will highlight them as I go on. The first in this is the resilience in which Kenyans bounce back, it’s amazing! Following the post elections violence, many people burnt their voters’ cards; many swore to never go for elections. When the IIEC called for the fresh registration of voter’s country wide, they optimistically but cautiously put a target of ten million, but this was surpassed! Twelve million Kenyans registered and 72% voter turn out was registered, that is resilience at its best. The journey was joyous, challenging, tough and exciting. I saw Kenyan citizens taking up the mantle and giving their time, resources and in terms of time, money and knowledge to enable other citizens understand the provisions in the then PCK. While they were two sides to this debate, those supporting (with the color Green) and those opposing the PCK (with the color Red) several issues came up. One unique entry into the debate was the Clergy where most of the Christian leaders openly opposed the PCK with the main bone of contention being the ‘abortion clause’. The ‘contentious’ clause (Article 26.4) reads ‘Abortion is not permitted unless in the opinion of a trained health professional there is need for emergency treatment, or the life or health of the mother is in danger; or if permitted by any other written law’ . Many discussions went on around this and the sorry fact is that the discussion was more of religious (men mostly) discussing the reproductive health of women and with some even out rightly showing disregard for the health of women. In many instances discussion was skewed to portray women as immoral human beings waiting to getting abortion at the earliest opportunity. The fact that there are millions of abortion related maternal deaths, or that abortion has not been expressly legalized in the provisions didn’t feature. My disappointment is the observation that the same clergy who are eager to protect life never speak out when laws to protect lives of women like the sexual offences act are being discussed. In one of the mainstream Churches, a clergy in the last few months was dismissed from his services in the Church when he openly expressed desire to take up parental responsibility of a child he had sired. For me this was just patriarchy flexing its muscles. As a result of the increased involvement of the clergy in the constitutional debate many of us stopped attending church services! The Church was clearly losing its influence and the clergy need to do much more to win back the confidence of the followers. Some of the hilarious happenings were the appearance of ‘Paul the Octopus’ joke! And the portrayal of ‘Green win’ was one hilarious graphics. As I engaged in different ways, I could feel excitement building and I felt the stakes were so high we could not afford to lose the proposed constitution. I saw this as the greatest opportunity for rebuilding Kenya and giving women what they have asked for long time. I failed to imagine the possibility of losing the vote in the referendum. Some of the great highlights included the civic education trainings, the rallies and conferences and the one-one engagements with different individuals on the same. One of common feedback in the forums I attended or facilitated, which were mostly forums for women, was the power of knowledge. At one time one woman commented that she was feeling like the spirit had descended on her; that was how she could describe deep feeling she got from realizing what the constitution had in store for her. The low moments was when I felt slighted by persons who found it upon themselves to make assumptions, and one person told me that I must have been given money to promote the constitution! This could not deter my efforts; neither did the different sentiments deter the efforts of other young women who I interacted closely with. We formed a support mechanism coming to each other’s assistance where need be and being there for each other. Sisterhood at it’s best. As the day drew nearer, I kept making sure that my voter’s card and ID are intact for the great day. I counted the day to the hour. Two days before the referendum, I started developing some sore throat which escalated to flu to the chest, but somehow it had not struck me to see a doctor until a friend asked if I had seen a doctor! On August 4, I had planned to be at polling station in my Gatundu North constituency at 0600hours but by then getting out of bed was a struggle. I managed to get to the polling station at 1000hrs and cast the vote! I had to recheck to make sure I had put the mark in the right place! Finally the day was here! As I went to hospital and later stayed in bed for two days following the proceedings as much as I could manage, I could not help but feel proud of being Kenyan. The world was watching with some predicting violence. There was peaceful voting! I was so impressed by the IIEC who conducted the elections n the best way we have had in history; it was a big win for Kenya. Kenyans became more informed than ever before and engaged on civic issues more than ever before. The media in Kenya played a great role in making sure that the citizens got a chance to know what was in the proposed constitution. Individuals organized to have forums in their localities. Women’s organizations held forums to educate women on the benefits that the PCK had for women. It was Kenyans for Kenya. 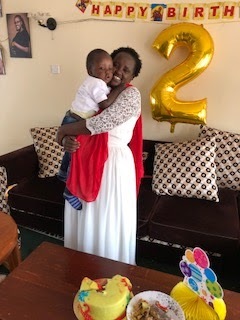 The first leg of journey is over, the baby is here, and regardless of the journey ahead in implementing, we can pose for a moment and celebrate! Oh Kenya we have a NEW CONSITUTION! No longer ‘proposed’ but NEW.